Rosemary Garlic Bread — always with butter. Finally I have made some proper bread! I have been meaning to do a bread post for a while now, but the rising time always has the tendency to deter me, as it does for many people. Warm, homemade bread straight from the oven. Is their anything better? Slather some butter on it and I'm golden. 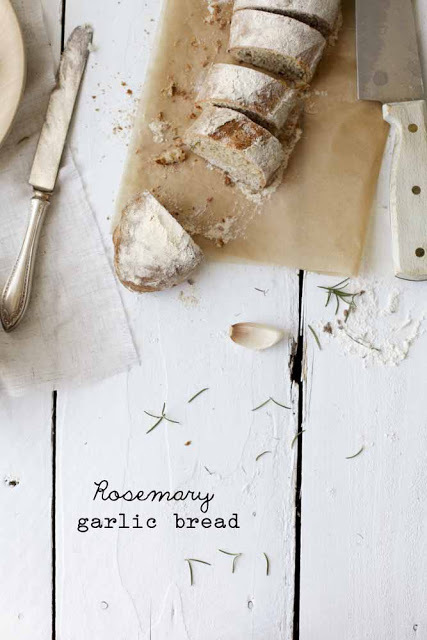 The addition of rosemary and garlic to this french bread makes it rustic and full of flavor. I made this bread by hand without a food processor or kitchenaid to do the kneading for me. This way may take a bit more time, but it is definitely worth it. You get to feel the dough in your hands and learn what the proper consistency is. Whenever I use a kitchenaid to make a dough, I always have to keep poking at it to see if the proper 'tacky-ness' has been achieved. Doing it by hand, you get to work the dough for the whole process, bits of flour can be subtly added in and it helps you for all future doughs. So take the time and do it the old-fashioned way. Thanks Christina for the rosemary from your garden. The rain has started! The heat wave seems to be finally over and sweater season is amoung us. I love this weather, a perfect excuse to spend the whole day snuggled up on the couch, only to get up to each copious amounts of cheese and bake brownies. Which might be exactly how I spent my day today and I love it. I served this bread with olive oil and vinegar as well as crumbled blue cheese. The cheese melts onto the warm bread and becomes a soft gooey mess. for 3 minutes. Whisk to combine then whisk in oil. wrap and let rise for 2 hoursor until doubled in size. Two baking sheets, dusted with flour. doubled in size, 1-2 hours. Oven 500, racks on lowest shelf of oven.